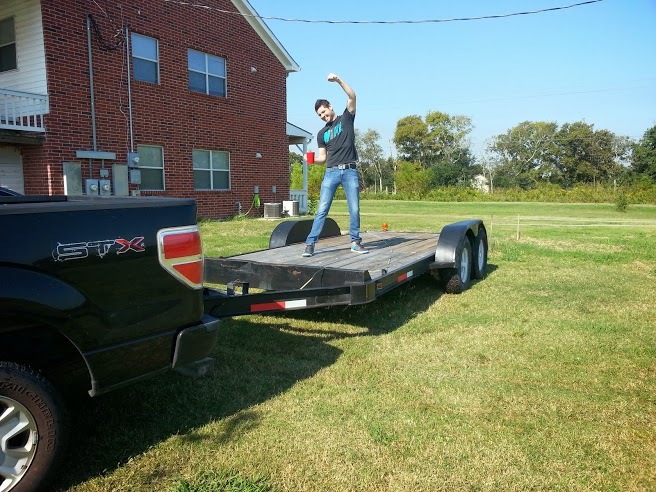 So We Bought a Trailer! It sounds a little like ‘We Bought a Zoo.’ It feels a little like that too. As if by making this large purchase we’ve really become pot committed — like we have to figure out how to run a zoo. But it is so exciting!! The whole tow home I was just beaming! I can’t wait to start this huge journey. We found it on Craigslist thanks to Matt. I was starting to get pretty frustrated because nothing was coming up. But we waited and waited, and then BAM! When it was posted, we jumped right on it! We drove about 2 1/2 hrs to pick it up, but it was worth it. It’s 16 feet long and rated for 12,000 lbs! It seemed to be in great condition with just a little surface rust. The tires will probably need to be replace in a year or two, but what are ya gonna do? Oh, and the best part? We got it for $2,500! Yay! Now we can get this party started! Before we can start building a tiny house on wheels, we’ll need a set of wheels. Shouldn’t be too hard, right? I mean we are in Texas, where trailers of all varieties abound. But seriously, they are everywhere! We do have some requirements, though, so here is a list of what we’re looking for in our new house foundation. ·Length: 16 or 18 ft. I have seen plenty of tiny house enthusiasts build their homes on a smaller plot, but for us I think 16 ft. would really work. It seems like maybe 16 ft. is the most common, but I’ve also seen 24 ft. gooseneck tiny homes! Can you imagine trying to tow that beast? Although, if we stumbled onto a great deal on a 18-footer, I wouldn’t turn it down. Most trailers you see have a pipe-top railing, and that just wouldn’t work for building a home on top. How would we put up the siding? 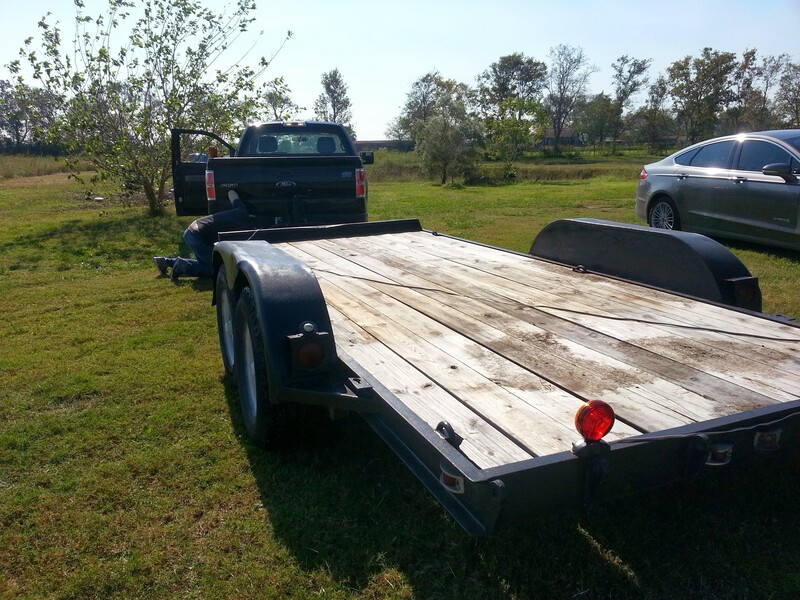 So we’re looking for something completely flat with wooden decking – a car hauler type. Some car haulers come with pipe-top rail along the tongue end of the trailer and that wouldn’t be too much of a problem because we could use a simple cutting disk on a hand grinding tool to remove it. Also, we want to avoid the dove-tail. You may have seen some trailers with a slanted deck on the last couple of feet, and while this is helpful for loading cars onto trailers, it would not be helpful in creating a level floor for our home. The average trailer at the length we’re looking for has two tandem axles that can each carry 3,500 lbs. That means a combined capacity of 7,000 lbs. I have seen tiny houses with very careful owners who keep their homes under the limit, but for the most part they seem to come in right at or just above 7,000 lbs. And that’s for 16 to 18-footers. It would be ideal if we found something a little more heavy-duty. Other options are two tandem 5,200 lb. axles for a combined GVWR (Gross Vehicle Weight Rating) of 10,400 lbs. or two 7,000 lb. axles for, you guessed it, a GVWR of 14,000 lbs. The latter would definitely be overkill, but it’s a common option when you get into the ‘heavy-duty’ classification. Trailers can vary a lot in price based on length, axle-strength, age/quality, and type. 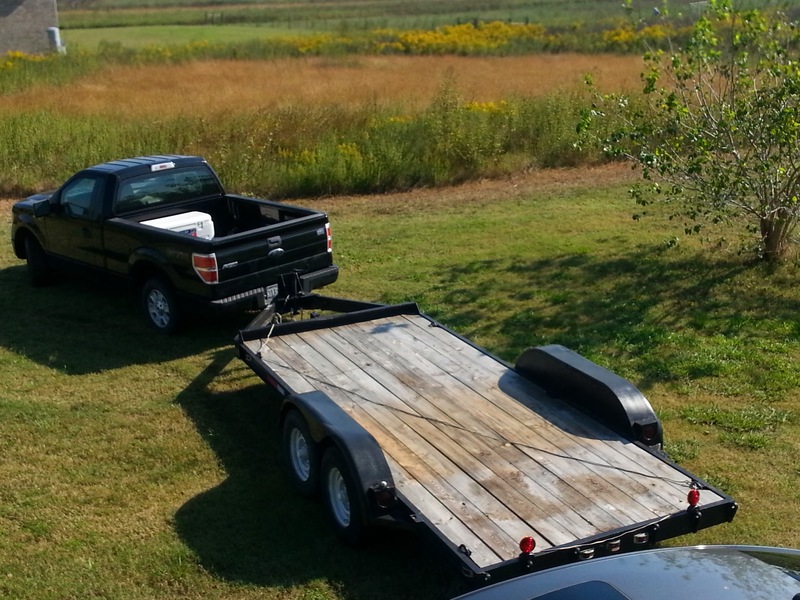 I think if we were looking for a brand new trailer as described above, we could spend $4,000-$5,000. But, I would prefer to find something used for under $3,000. Every now and then there’s a deal where someone just wants to get rid of it so they’re selling for $1,500. That would be awesome! Usually a trailer like that might need new tires and probably have some surface rust. But those are easy problems to fix. And that about does it. I’ll be scouring Craigslist every day, and next week I’m looking forward to searching with M at a few of the many trailer lots around our area.